What makes log management and analysis so challenging? In distributed systems, there are various types of logs which may or may not be in the JSON logging format. Traditional in-house setups are not equipped to handle this complexity. Many log analysis solutions tend to get slower as the log volume increases. With limited automation, searching through text logs and tracing the root cause of issues takes a great deal of time and effort. Teams often rely on multiple open-source solutions to visualize their logs. All these tools, however, require complex configurations. Teams have to constantly shuffle between multiple tools. SolarWinds® Loggly® is a cloud-based log management and analytics solution which supports a large variety of structured and unstructured text logs. However, as JSON has become a standard log format, you can consider logging in JSON. JSON essentially creates a structured database of your logs, even if there are too many events for you to read manually. With Loggly, you can crunch through hundreds of thousands of JSON events per second and extract the true value of JSON logging. Because Loggly doesn’t use agents, it is also incredibly easy to set up. Moreover, as your logs move past the log retention period, Loggly automatically archives them on AWS S3 buckets. You can maintain these logs for as long as you want for compliance or other purposes. If you are logging in JSON, you’re already on the right path; however, your JSON logging efforts won’t be effective until you put in place a scalable, reliable JSON log viewer that can take full advantage of JSON’s structure. Loggly parses logs as soon as it receives them, creating a real-time map of your logs’ structure that is viewable and clickable through the dynamic field explorer. 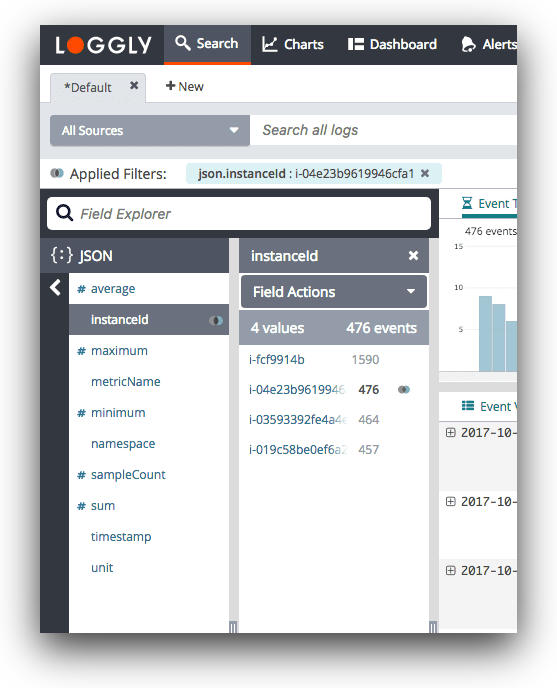 Instead of relying on guesswork and iterative searches to figure out where to look for a problem, you can utilize JSON field counts and other metrics to guide you to the answers. With JSON’s flexibility for adding and removing fields, Loggly even picks up changes to your logs with no action on your part. The explorer significantly reduces the time in troubleshooting and helps you quickly gain useful insights into your data. In addition to providing a powerful JSON logger, Loggly offers integrated charts which allow you to visualize the results of your search query. There are many types of bar or line charts to choose from. These charts can be combined together to create a unified dashboard. You can share these dashboards with your team and restrict access to who can manage and edit the dashboards. Furthermore, the dashboard can be downloaded in the form of a PNG image, in case you want to send a report to anyone via email, HipChat, or Slack. You can also project the dashboard on large screens in your operations center to keep everyone on the same page. Loggly also integrates with DevOps tools like Jira and GitHub to help your team collaborate smoothly.